"Then all of a sudden there was Saint Joseph, and he looked the same way as I am used to seeing him, only without the staff, with the hair parted, long hair, light gray across the top but not too much, just right at the top. His eyes were transparent, same beard. I can't describe everything. A brown robe and a gold like dress. He stood on a cloud but I could see his feet. He just smiled at me and said, 'My child, God The Father has desired to ask you through me that a painting of His Most Sacred Heart be painted and done.' At this moment I just interiorly felt that it should be something like the Blue Scapular of God The Father holding out His Heart offered to humanity. And then he went on to say, "God wishes it to be completed by April 13th," and I got the feeling that was it, and then he blessed me, and the thing was over. I remember seeing black and I woke up. Chris told the Core Group of the Moving Heart Foundation about the dream, and Elizabeth McKenna, who had done the drawings for the Blue Scapular of the Sacred Heart of God the Father, felt strongly that she was to do the painting. She was prayed over and anointed in front of the Blessed Sacrament at a prayer meeting, and the Core Group prayed the second Novena of the Mother of Mercy asking that the painting would be accomplished according to the Will of God. The artist immediately began painting the image, working almost exclusively on the painting for three weeks. The work went much more quickly than usual and she felt doing the painting was a spiritual experience. As she worked, she wore her God the Father of All Mankind chaplet beads, which had previously turned gold. She prayed the whole time she was painting and felt Jesus was painting with her. She cried several times during the process, feeling that she was inadequate to do the painting. I hold out My heart to give it to humanity, to all My children in a last and desperate attempt to save their souls and restore life to My children. I desire that people venerate the image of My Fatherly Sacred Heart. I desire that people place this picture alongside the Sacred Heart of Jesus and the Immaculate Heart of Mary painting and pictures. I desire to be venerated in the homes. Every family should honor the heart of the Father, for it is out of the heart of the Father that I sent you My only begotten Son to save and redeem humanity. Today, I give My heart as a symbol of My love and to draw them back to My Spirit which I give freely through Jesus and the Holy Spirit. Come back to My heart, live in My kingdom, and receive My true peace. For this to happen, people must venerate and acknowledge My Fatherly Sacred Heart. Oh, how so often it is spoken of in Holy Scriptures, yet no one pays any attention to it. My heart is real! It truly beats and longs for all My children to be in My kingdom and free from sin and Satan. My heart yearned to send the Savior, My Son, into the world, and through that I send also, through My heart, your only mother, your Most Holy Mother, and she loves you so much and desires you to return back to the Kingdom of Heaven also. I desire that through this painting, great conversions will be given, and that the family that venerates Me and My Fatherly Sacred Heart will receive grace in abundance. The first is that the family shall have peace, and second, the fathers shall be given all the graces that they need to lovingly discipline their children and draw them closer in love to My heart and to Jesus. Three, I shall give to those who make a request to My heart, peace, true peace. I shall answer your request but only according to My Will. I shall also give to you the grace of knowing My Will. Whatever My Will is for you, you will know when you venerate My Sacred Heart. It is only through veneration of My Fatherly Sacred Heart that you will know what My Will is for you. My heart I give to humanity. Take up My heart by living the gospels of My Son and by living every word of Sacred Scripture. Receive My heart, My dear ones, by loving Me and accepting Me as your Father. All graces come to you through Me first. I am the Father. I am God. Every grace I give, I give to you. I also give through Jesus, My Son who is the second person of the Most Holy Trinity, and through Our Lady, your Most Holy Mother. I give you My heart. Do not blaspheme My heart. Do not mock Me. Never tempt Me, for My eyes see all. For those who love Me, I shall bless. For those who hate Me, I shall curse. I desire to give you My heart, but you must receive it in a state of grace. You must be willing to love unconditionally. Now I shall depart, but before I shall depart, I desire to tell you that I mourn over the separation of churches, especially the Orthodox and Catholic churches. Everyone should realize that they are one Church united through My Son and dwell within My heart. The separation of the churches is of your own doing. I desire to save humanity, but it is humanity's choice whether they will receive My heart or reject it. If they reject it, the greatest chastisement that I will send upon humanity will be to forsake you. I will leave you to your own doing. This is the worst punishment ever because I have always dwelt with My people throughout all times. But when My people did not listen, even in the Old Testament, I departed from them. So do not be concerned about worldly goods, but be concerned about the love you have for Me, My Son, the Holy Spirit, and your Blessed Mother. 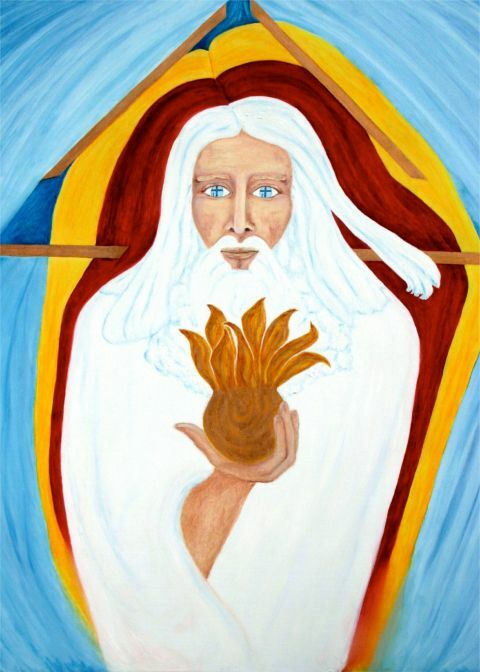 The painting is based on Chris Courtis' descriptions of God the Father during His apparitions to Chris. The timelessness of the Father is represented in the face, which appears young and vital while the hair is old and ancient. The universality of the Father is also evident in the face, which could be that of any man of any nationality. In the Father's eyes are the Cross of His Son Jesus with the Blessed Mother standing beneath it reminding us that we can only come to God the Father through the Cross of Jesus, and Mary, our mother, is always at the foot of the Cross. It also reminds us that God the Father sees mankind as redeemed through the Cross of Jesus. The flowing hair represents movement of the Holy Spirit as God the Father is the creator and mover of all things. The intense white of the hair and the robe represents perfection. The purist white oil paint available was used. The part in the hair that seems to continue through the red and yellow colors represents the peeling away of time and space as we know it. The three primary colors evident in the painting, red, yellow, and blue are the colors from which all other colors in God the Father's creation are made. Also, the red represents the passion and death of His Son Jesus, which redeemed us. Yellow represents the light and sanctification of the Holy Spirit. Blue represents the movement of Creation. Thus the primary colors represent the Holy and Divine Order of Creation, Redemption, and Sanctification. The primary colors are also the basis of the rainbow, a sign of covenant between God the Father and mankind. The golden triangle in the painting represents the Triune Godhead - Father, Son, and Holy Spirit. The Trinity is also represented in the eyes of the Father with the love (the Holy Spirit) proceeding from the Father and the Son, that love that sent Jesus to die for our sins so we could return home to our Father God. The figure beneath the Cross is Mary, the Mother of God Jesus who is always with her Son. The heart of God the Father is of solid gold, tried and true. (Real gold paint was used.) The flames of love burst out of the solid gold. There are eight flames, which represent the eight steps going up to the altar of God in the new temple as envisioned by Ezekiel. They also represent the eight steps of Consecration to God Our Father given to Barbara Centelli, (1998) – praise, thanksgiving, offering, repentance, inheritance, saying "yes" to the Father, fidelity, and consecration.